December | 2013 | Sarasota & Bradenton Florida Real Estate & More! The national median listing price was $179,900 in January 2012 and rose to $180,000 by December 2012, according to realtor.com® research. The pace of price appreciation accelerated quickly over the year to reach a median list price of $199,500 by September 2013. “We expected mortgage rates to rise in 2013, and they started to increase in the late spring, but they’re still very affordable when you look at rates on a historical basis,” Yun said. “They just aren’t at the super-low point we saw earlier.” According to Freddie Mac, 30-year fixed-rate loans were as low as 3.45 percent in December 2012 and rose to 4.49 in September 2013. Barry Habib, co-owner and chief market strategist for Residential Finance Corp., said mortgage rates are likely to stay low and perhaps even drop between now and March 2014. The combination of rising prices, low mortgage rates and low inventory led to a sense of urgency among buyers and the return of bidding wars, said Don Frommeyer, president of the National Association of Mortgage Brokers. According to realtor.com® research, inventory in 2012 reached a high of 2,083,710 homes on the market, then steadily declined to a low of 1,583,497 homes in February 2013. At the end of September 2013, 2,210,000 homes were for sale, approximately a five-month supply. Westfield Group’s Southgate Mall has begun renovations that will transform the indoor mall into an outdoor shopping and nightlife destination. The Australian-based mall developer announced the mall’s plans for redevelopment in May at the International Council of Shopping Centers Recon Convention in Las Vegas. The mall will add 46,000 square feet of new space to the existing property. Construction was supposed to begin by the end of the year, though plans have been pushed back. Westfield’s plans for Southgate Mall comes after an announcement by its premiere anchor Saks Fifth Avenue — and possibly others — to leave the Sarasota mall in favor of a new, $315 million enclosed retail hub being developed at Interstate 75 and University Parkway by a joint venture between Taubman Centers Inc. and Manatee County’s Benderson Development Co.
Last year, a New York-based real estate firm O’Connor Capital Partners bought 49.9 percent interest in six of Westfield’s Florida malls in March, a deal that included both Sarasota properties. The first phase of the multimillion dollar investment at Southgate Mall includes the installation of new travertine tile, upgraded furnishings, fixtures, outdoor landscaping and color scheme, according to a statement by Westfield Group. This initial phase will also feature refurbished shopper amenities, a new interior trellis system, fountains and new lighting. 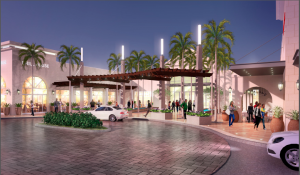 The mall’s name will also change, from Southgate Mall to Westfield Siesta Key. Westfield officials claim that “retailer interest in the project remains very high.” The next phases of renovation will include bringing in new chain stores and rebranding the shopping center. Those additions will be announced next year. The developers of the Mall at University Town Center made five new restaurant openings official on Monday for the $315 million project scheduled to open in October 2014. All five chains are new to Sarasota and Manatee counties. That polished, upscale chains are coming here bodes well for the region, said Darren Tristano, executive vice president of Technomic, a food consultant firm in Chicago. For example, the Cheesecake Factory, known for its expansive menu offerings and decadent cheesecake desserts, typically builds elaborate 10,000- to 12,000-square-foot restaurants. But in recent years, the chain has scaled back its restaurant footprints — to 8,000 square feet to 10,000 square feet — as it entered more suburban markets and connected “dots” geographically between restaurants. According to a recent site plan obtained by the Herald-Tribune, the mall also will play host to a bevy of new high-end stores, including Gucci, Tiffany’s & Co., Armani and several dozen others that have tentatively committed to the property. Other new stores scheduled to debut at the mall, according to the site plan, include Anthropologie, Michael Kors, Kate Spade, Sony and Salvatore Ferragamo. Those are names that often find homes in high-end centers like the Mall at Millenia in Orlando and International Plaza in Tampa, two other Taubman properties in Florida. All five chains have restaurants at other Taubman Center malls across the country. H&M — which stands for Hennes & Mauritz — also is slated to open its first store in the Sarasota-Bradenton market at the Mall at University Town Center. The Swedish retailer sells trendy, fashionable apparel and accessories for young men and women. The mall’s three confirmed anchors are Saks Fifth Avenue, Macy’s and Dillard’s. When plans to build the mall stalled during the height of the Great Recession, high-end anchors Nordstrom and Neiman Marcus dropped from the roster. But with brands like Tiffany’s and designer fashions from Salvatore Ferragamo, the mall will compare favorably with other luxury properties across the state. It also will be the only upscale mall between International Plaza in Tampa and Waterside Shops in Naples, and the only enclosed one between Tampa and Miami. The Mall at University Town Center is only the second new mall in any phase of construction in the U.S. since 2012. The other, City Creek Center in Salt Lake City, opened in March 2012. EARLIER: The developers of the Mall at University Town Center made five new restaurant openings official on Monday for the $315 million project scheduled to open in October 2014. All five chains are new to Sarasota and Manatee counties. Those are names that often find homes in high-end centers like the Mall at Millenia in Orlando and International Plaza in Tampa, two other Taubman properties in Florida. The C & G International Team is one of the top Real Estate Teams at Keller Williams Lakewood Ranch. Call us now for any of your real estate needs! 941-556-5030 or 941-266-3872.